Little Passports is a subscription box for kids that teaches them about geography and world cultures in a really fun way! This review is of the World Edition for ages 6-10, but they also have a subscription for Early Explorers (ages 3-5), and a USA Edition for ages 7-12. The Products: Every month, Little Passports sends items to promote learning about the location, culture, and language of a different foreign country. 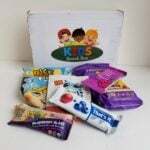 Boxes include items such as stickers, activity sheets, souvenirs, and access to online games, all of which encourage kids to explore the world. Check out all of our Little Passports reviews and the Kids Subscription Box Directory! This month’s destination is Italy! Italy is one of my favorite countries in the whole world! On the left is a letter from Sam and Sofia, the Little Passports characters, chronicling their adventures in Italy. I like to ask my son to read the letter to me for practice. On the right is an activity booklet with games and puzzles. I am always impressed with the variety of educational activities Little Passports manages to fit into four pages. Every month, Little Passports sends these little collectible items to document the destination. On the left is a luggage tag to put on my son’s suitcase they sent in the welcome package. On the lower right is a sticker for the suitcase. Above that is a sticker of the country’s flag to put in his passport and a pin sticker to mark the world map. Both the passport and the world map were also included in the welcome package. Another standard item that comes every month is a postcard that usually has the Little Passports characters standing in front of an iconic landmark. In this month’s postcard, they are on a gondola in the canals of Venice! Bellissima! Little Passports also sends a small souvenir every month. This month they sent a puzzle kit to build the Rialto Bridge and Gondola! Verdict: We are big fans of Little Passports! They always do a good job helping my son learn about other countries and cultures for a very reasonable subscription price. Plus it really does feel like a nice care package sent from overseas by a relative or other loved one. I think it’s a good way to make children aware of how very different life is in different countries! What do you think of Little Passports?